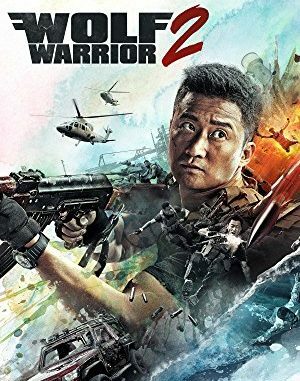 Wolf Warrior 2 is tearing right now through cinemas in China, making worldwide film history but it is virtually unknown outside its domestic market. It is also a terrific action film, an incredible box office success, and an important political statement. The movie is important for so many reasons that you should check it out if you can. First some statistics. Directed by a martial art star Wu Jing, Wolf Warrior 2 is a Chinese movie that made over $800 million in the first month of its domestic release. It is China’s highest grossing film ever, outdistancing The Mermaid (last year’s fantasy tale by Stephen Chow, another movie that was seen only in China but that made $527 million) and the second-biggest movie release in that market ever. It is therefore a phenomenal blockbuster in the Chinese market that until now has been dominated by American action movies such as Transformers and animated tales like Zootopia. Any movie made on a $30 million budget that racks up that kind of explosive box office makes industry trackers sit up and pay attention. This summer, the US box office has been in absolute doldrums with movie theater stock prices in the gutter. In China, thanks to Wolf Warrior 2, the box office during the summer period is a completely different story. Wu Jing portrays Lang Feng, an ex-special forces operative who has has been dismissed from the army and even imprisoned for a showdown with a slum landlord. Lang is looking to avenge a death of his fiancée killed in Africa so he moves to some unnamed country in that continent, making ends meet as a grocery store supplier. He is brought back into action when some Chinese factory workers get caught in an outburst of a civil war and Lang must use his special forces training to bring them to safety. There is plenty of good action here. If some of the movie’s scenes feel very Hollywood (in a good sense of the word) it is because they were indeed consulted by Hollywood action movie veterans, such as Joe and Anthony Russo, the directors of Captain America, and arranged by a stunt coordinator Sam Hargrave. A car chase that is a must in any action movie, here is actually a showdown between two tanks trying to grind the other one off the road. There is a Bond-style underwater knife fight sequence of our hero taking on a bunch of pirates who threaten a tanker ship. And even better scene of urban warfare in a street market – fast, brutal and extremely realistic. Finally, for lovers of martial arts, and there is no lack of those in China, there is also plenty to watch when Wu Jing demonstrates his prowess of Bruce Lee-style series of one-fisted punches that replace a ballet choreography of a typical kung-fu fight. Since the Chinese box office is dominated by U.S. fantasy and action films, a good local film showcasing homegrown stars would be enough to bring large audiences to theaters. However, it was its well-executed mix of entertainment and ideology that made this movie resonate so profoundly with Chinese audiences. Wolf Warrior 2 is full of images and statements that underscore Chinese power and national pride but unlike many of its predecessors, they actually feel more genuine and justified. In old Chinese war movies (especially the ones from 1950’s through 1970’s) there was often a smiling and singing hero who was marching into the sunset waving a flag amidst enemy bullets. There is an echo of that in a scene where Lang indeed waves a Chinese flag trying to get through an enemy blockade but he succeeds not because he is so ideologically correct, but because even the African rebels recognize practicalities of contemporary politics. One of the bad guys explains his reasoning quite plainly to his troops: even these rebels need China to vote in their favor at the security council and after the war they will still need their investments. This being a popcorn movie after all, the reasoning may be a bit simplified but it does have a point as far as the region’s political realities go. Wolf Warrior 2 is structured like a classic “lone warrior saves a group of civilians from a band of rogues” story, except Lang is not really a lone wolf as his name would imply. He literally has China’s Navy as his back-up. A modern equivalent of a “cavalry to the rescue” is provided by a last minute intervention of a Navy ship shooting missiles off the coast of Africa. They sail for thousands of miles to hit the rebels with a pinpoint accuracy. This is the image than speaks stronger than a thousand words. It is clear that Lang’s compatriots have both means and determination to protect the country’s interests and citizens. With 5000 years of continuous recorded history, China has always had a reason to feel good about its past and culture. However only recently the country has also had a very good reason to feel proud of its economic and military power. For a country that had a very traumatic 19th and 20th century history, this century is starting on different note. There is a mood of national pride and Wolf Warrior 2 taps perfectly into that sentiment. Chinese film industry is growing in leaps and bounds. China’s state film regulatory body (SAPPRFT) has just announced that by 2020 its growing film market will surpass the the US in the amount of box office generated while it already surpassed it in the number of screens (China has 444,000 screens). A movie like Wolf Warrior 2 is a milestone in the explosive growth of that industry and a perfect example of homegrown talent that can draw on the new industry’s strength and a resurgence of national pride at the same time.